Whenever the United States Navy submarine leaves the port on a mission, once it reaches the deep water the crew perform an exercise called Angles and Dangles. Consisting of a series of repetitive dives and rises at increasingly steeper pitches that also affects roll and yaw, the purpose of the drill is to locate any item stowed improperly. Under the stress of maneuvers, objects will shift or fall and dangle, revealing origins of clatter that can put the crew at risk and jeopardize the mission. Angles and Dangles eradicate potential sources of noise induced by human factor and ensure that the boat is ready for the silent mode, one of the paramount aspects of submarine warfare. From time to time, all of us perform Angles and Dangles in our lives, trying to fix things that create outer and inner noise. …simple clanks on our bikes or strange sounds of smoothie makers up to team meetings with coworkers to tune up a rapport, occasionally extending into the rattle and hum of personal expectations and, thankfully, rarely transforming into the dissonance of our own fallacies, the noise we create is natural, permanent, and inevitable. Since it can significantly reduce our joy and benefits – not to mention to put us at risk and jeopardize our ‘mission’ — the personal Angles and Dangles exercise is of the paramount importance for progressive life. We conduct it either alone or with our partners and friends, while strangers on transoceanic flights can provide for an ideal environment. On the other hand, from time to time, we tend to disregard the din and leave it to progressively grow. Why? Because we’re humans. So, between all those growing sounds we isolate one or two considered of being decisive for our agenda and we successfully convince ourselves that they are the deal makers. Of course, they’re not — they’re blunders, but we don’t know that at the time. The power of autosuggestion is such that we become temporarily deaf to intuition’s warnings and proceed. When eventual and inevitable happens, we realize that the consequences are performing Angles and Dangles on ourselves. Myths can occasionally produce such outcomes. While they are instructive in the interpretation of customs and models of our behavior through the history – widely endorsed and held at that – they are more often than not the aggregate of false beliefs and ideas. Though not always, myths can influence our decisions and lead toward an uproar, even turmoil in our lives. Some people are more susceptible to myths. Other areas in our lives are more predisposed to them. Interestingly, there is a strange and long-lasting relationship between myths and luck — they flourish proportionally to our fortunes’ fortunes. Science, for instance, is devoid of myths. Indiana Jones explorations are based on them. Our pastimes, say, blackjack? Under the regular impact of the myths. 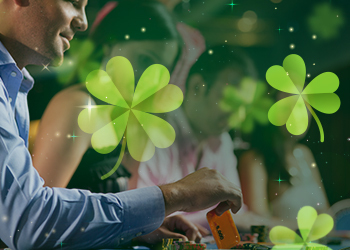 …the most popular table game in the United States casinos is so susceptible to them that you might have already heard or felt the discord between blackjack mythology and reality. Thus, we decided to conduct Angles and Dangles on blackjack myths and explore all of their, well – angles, and dangles. #1 Counting cards is impossibly hard. It is not. You don’t have to have a photographic memory or to be a mathematical genius – or savant, for that matter – and to possess some exceptional or superhuman feat to count the cards. You just need a lifetime to learn it right. Also, you need to employ the proper system for counting cards. There are quite a few of them, depending on a number of decks involved. Techniques that work for one deck will not be sufficient for the multitude of them since it, naturally, gets proportionally harder to count cards as the number of decks involved rises. #2 Counting cards is illegal. It’s not. There is no law stipulating that. Surely, the casinos encourage this myth and you’ll stumble into a number of Hollywood stories about casinos effectively ‘taking matters in their own hands’ when it comes to card counters, but casinos’ rationale is to do whatever is in their power to keep an edge. Stories included. Truth is, no one can stop you from thinking about the game and enjoying in the results of your mental efforts. If they involve counting the cards, so be it. Though, keep those findings for yourself, inside of that head of yours where the powers of counting cards originated. Particularly if you win big. #3 I’ll get rich by counting cards. You won’t. You can memorize five decks by heart and still not get rich. Why? Because you need a proper strategy and a couple of other things to start with. 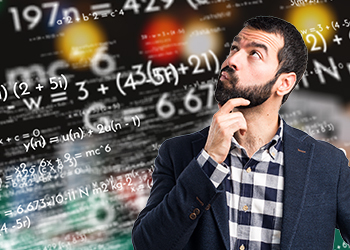 Surely, you’ll get the mathematical advantage over casino by learning to count cards, but without quality betting system, it’s all to nothing. In fact, playing without good strategy will more likely put you into the hole that you’ll find hard to dig yourself out of. Also, you will need a large bankroll to raise and lower your bets in wild swings increasing the volatility of the game. And to do that you will have to be rich in the first place. #4 Perfect strategy will give me the edge. It won’t. Nothing will ever give you the edge over the casino and it has nothing to do with your skills, luck, strategy, bad dealer, hot table, or anything else. What effectively takes away your edge always is the fact that dealer has the last hand. So when you get busted it’s irrelevant what the dealer has — you’re done. If we were to look into this setup based on fair play, the game would take into account the dealer’s hand afterward and if you both get busted, you would go for a rubber. But that’s not the blackjack. #5 Blackjack is rigged, I can’t beat it. You can. Surely it’s a steep ascent that requires lots of things to come together, but it’s not rigged. Not in a sense that anyone can decide who gets to win or lose. Of course, like in every casino game, the math behind the game increases the odds in casinos’ favor — that’s the nature of the beast. But blackjack offers very long-term possibilities for a win to the educated, skillful, and disciplined player that employs proper betting strategy and advanced gambling techniques (notwithstanding myth #4, of course). 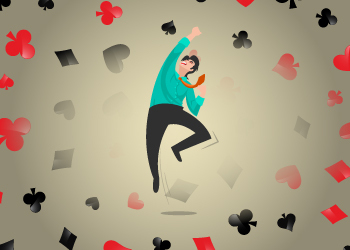 Don’t forget — blackjack is the game of skill and almost even chances. #6 Other players hurt my chances. They don’t. It’s just your mind playing the tricks: it’s always easier to blame the others for our misfortunes. Don’t believe in everything you think. You play against the dealer, not the other players. So, when Flippant Joe and Kate Oblivious jump into the game mid-shoe, add another hand to the round, and the dealer starts killing everybody again, it has nothing to do with poor Kate and Joe, nor with your juju, but with blackjack being the game of probabilities. The only thing that other players can affect is your concentration. Thus, improving your focus may be a much better solution. #7 I’ll get some, I’m due to win eventually. You won’t, you’re not. If the dealer has won seven hands in a row it does not increases your chances nor should it affect your bets. Measured across the very, very long time the statistical probability of you winning the blackjack is 48%. But in gambling games, each hand, every round is an independent event. Add deck composition change to the equitation and the logical conclusion is obvious: you are not going to win based on the number of wins and losses in a row. This is known as the gamblers’ fallacy. Your odds in blackjack change based on the ratio of aces, 10s, and pictures in the decks. And to keep up with that you have to count the cards. #8 The dealer always has a 10 in the hole. Not always, just 30.77% of the time. There are sixteen cards in one deck that are worth ten points each — 10s, jacks, queens, and kings. The other thirty-six cards have a different value. Those 16/52 equals close to 1 in 3 chance that the dealer has a 10 in the hole. In the remaining 69.23% of the time, the dealer will have something else in the hole. Playing your hands with the assumption that a 10 is in the hole can lead to very costly playing mistakes. 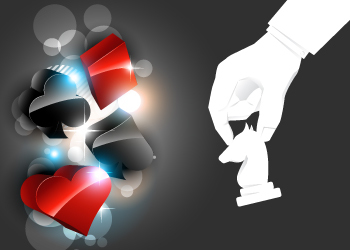 Quality playing strategy assumes all cards in dealer’s hole and factors for all hits. Just learn it, use it well, and never stop improving yourself and your game. #9 Progressive betting will help me win. Perhaps. As systems that comprise of raising the size of your bets in accordance with a number of losses in a row, they firstly require you to know all nuts and bolts of different progressives in blackjack that are similar to roulette. Then you need a larger bankroll which is to say that you are an astute player. And if you are such you will have heard of gamblers’ fallacy already. Truth is, with progressive bets you might cover your losses to some extent. But eventually, you will have to make a huge bet that might turn out to be the devastating one you cannot afford, turning this myth into mathematical nonsense that cannot and will not give you an edge. On the other hand, if you venture into depths of progressive waters, it should be because you’re counting the cards. #10 Colder table gives me hotter chances. No, it does not. This is closely related to #6 – again, don’t believe in everything you think. Or see, for that matter. Just because the dealer is cold at the moment, which is not hard to tell, doesn’t mean it won’t get hot in the next hand. Because it’s not up to the dealer but up to the cards. And cards don’t know what happened earlier, don’t care who deals them. They just want to be played. As soon as you realize this it is all up to the skills, knowledge, strategies and, of course, luck — that can turn volcanos into icebergs and vice versa — you will start to look differently into predictabilities of blackjack. #11 I will always stand on soft 18. True, but not always. Contrary to the common belief, the objective of blackjack is not to get as close as possible to 21 but to beat the dealer either by having a higher final total or by not busting before it does. That’s what you strive for. Thus, soft 18 is a good hand when the dealer shows a 2 or 7 up card. But against dealer’s weak up card of, say, 3, 4, 5, or 6 – not so much. When you face this scenario, it’s probably better to double it down (although it’s really your call). Because now your goal is not to improve your position but to increase the bet when the dealer is most vulnerable – effectively turning #4 against the house. #12 Pictures comes in pairs. Absolutely not. 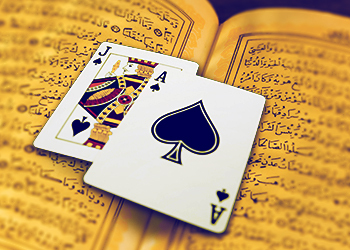 Players often think that a face card is followed by another face card, or as they say, that ‘pictures follow pictures’. Quite the opposite is true. There are twelve face cards in the deck which gives you 23% of chance in one deck game (12/52). When, for example, the queen is already dealt the probability of a jack to follow is 21% (11/51), and this is assuming that queen is the first face card to come out, which does not have to be the case. The cumulative probability of two face cards to follow each other in the first place is — 5%. So, please, purge this one on the spot. Funny thing, the myths. While surely valuable means to understand our history to some extent and certain origins of our views, habits, and behavior, they can also be misleading. They are like the coin, two-sided stories we choose to believe in or not. Who is to say which ones are true? We have to do it for ourselves. It’s the question of the choice. If we decide to believe in myths that turn out to be false beliefs, we may end up like Sisyphus that was forced to roll an immense boulder up a hill only for it to roll down as he nears the top, repeating his actions for eternity. Or like Tantalus, that was made to stand in a pool of water beneath the fruit tree, forever eluded that fruits are within his grasp and water receding before he could take a drink. …there are myths that may not be true but may provide us with benefits. For example, Spartans held to the mythology of Stoicism that gave them strength to face and endure hardships with courage and determination. Nowadays, Stoicism is not the myth but respected philosophy and favored world view by many. Including the gamblers. In the end, it’s all in the angles. And their dangles. If the angle resembles the symphony – be it in our lives, relationships, work, hobbies, sports, or pastimes – it is the one we should follow no matter how steep or narrow the path may be. However, when the angle starts to dangle in cacophony under the stress of reality maneuvers, you just know its time to fix it before it jeopardizes your mission and put not only yourself but your loved ones at risk. So yup, dive and rise in every sense of the word, by all means, whenever you can, but do it prudently. Particularly in blackjack.